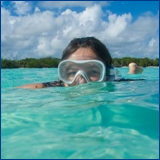 Plastic Beach Bags keep everything where you want it and easy to find. I've been looking for a tote bag that I can set down on the sand without the sand migrating into the stuff inside. Every time I get to the beach or a beach palapa it occurs to me that when I put the bag down in the sand, grit is going to stick on my fabric bag and may even get inside and damage the camera or cell phone. And have you ever put a damp fabric bag down in the sand? You won't do that again anytime soon. It's time to look for a new beach bag. So I ask myself, what do I expect from my new beach bag? Here's a list of characteristics that I'm looking for. Roomy enough for all of my beach bag booty. 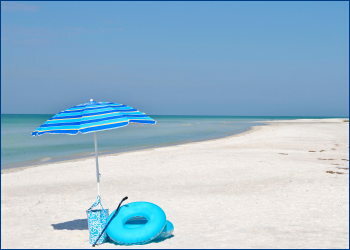 Protection from sand and moisture. A snap to locate the contents when I want them. You can see why a plastic beach bag rose to the top of the pile in my quest for a terrific tote. Here's what I've found in my search for plastic beach bags. As far as beach totes go, this stylish number is a winner. 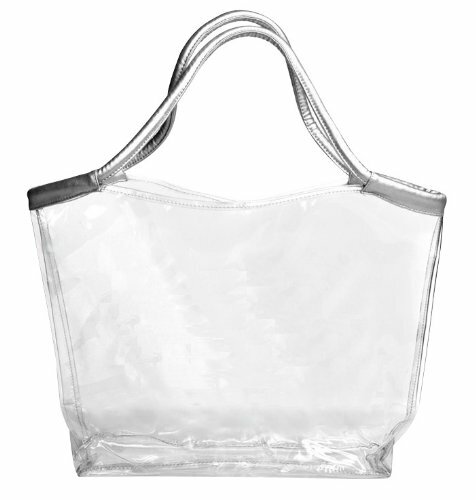 Sturdily fashioned from a heavy, crystal clear vinyl and trimmed with silver colored handles that slip over the shoulder for care free transport to the beach or anywhere else you fancy. The silver colored handles dress up the practical vinyl to deliver a bag that's anything but ordinary but so able. 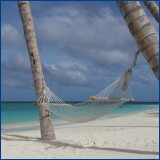 Measuring 12.5 x 5 x 18 inches it'll easily hold everything you need for a day at the beach. 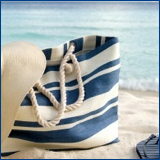 Classic tote measures in at a roomy 19 x 6 x 14 inches, big enough to carry everything you'll need for a day at the beach. 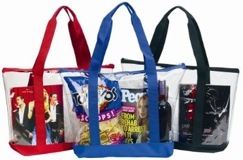 Although the bag is clear it's trimmed with red, blue or black at the bottom and straps making it pretty and practical. A zipper completely encloses the bags contents and a clear pocket holds small items and keeps them easy to find. The colored straps, which are just the right length for carrying the bag over your shoulder, rise from the base to the top, strengthening the already sturdy 3mm PVC body.